and to do your part in helping keep the environment clean. People use special energy saving light bulbs, only wash clothes in cold water, hang wet clothing outside to dry, install solar lights and do many other things to save energy and money. However, have you given any thoughts as to how you can actually go green in your laundry room? While this is one of the most commonly used rooms in a person’s home, it also one of the most overlooked as well. There are several things a homeowner can do in terms of saving money and energy in the laundry room. By carefully selecting a washing machine and dryer, you can find machines that have passed energy saving standards and carry the Energy Star Label, which allow a consumer to save water and energy at the same time. Getting a new energy efficient washing machine and dryer, means a person can use less energy and save money on their utility bill each month. 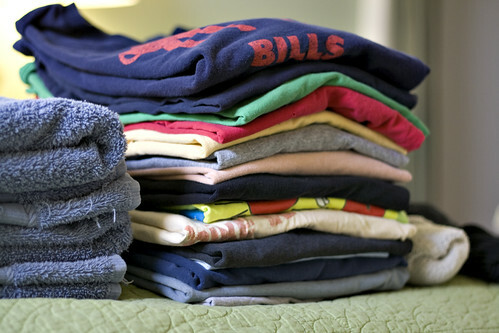 Approximately 90% of the energy exerted during washing clothes is the amount of energy required to heat the water. Washing clothes in cold water whenever possible will save energy and extends the life of some of your clothing so it is a good practice to “go green” in your laundry room. Also, it is a good idea and saves money to wash clothing only when you have enough to make a large load; you run the machine much less and save money on laundry soap and energy as well. When looking for other ways to go “green” in your laundry room, do not overlook the products you use to wash your clothes. If you want to go green when doing your laundry, look for a detergent that is plant-based and use non-chlorine bleach products made from sodium perborate or sodium percarbonate. When you have stains, soak the clothing in Borax, hydrogen peroxide, lemon juice or vinegar. Instead of using fabric softener, add a quarter cup of baking soda to the load for extra softness and brighter colors and whites. As a consumer, going green means committing yourself to purchasing natural cleaning products and using the least damaging cleaners you can find. When buying laundry soap, purchase a brand that uses recycled containers. Most conventional laundry detergents are made from petroleum based chemicals and phosphates; these can be linked to certain types of cancer and reproductive problems. Chlorine bleach should also be banned from the laundry room, it is highly caustic and it goes from the drain and directly into the environment. Bleach contains chemicals that are carcinogenic (cancer-causing), and can damage the earth’s ozone layer as well, so it is a good idea to find an alternative when you need to get your clothing whiter and brighter. Through adopting a “green” attitude and being cautious when purchasing laundry room products, a person can do their part to keep the earth clean. Going “green,” is a good way to enrich your home environment and helps reduce the release of greenhouse gases and other harmful chemicals. Going “green” is the best way a consumer can protect their health, and by reducing the amount of harmful chemicals used in the house and thereby making the earth a friendlier, cleaner place in which to live.